Art Kleiner of Kleiner's Korner forwarded one of the most challenging and fun Mystery Fotos ever posted! Where is the location of the Mystery Foto and from which direction was it taken? 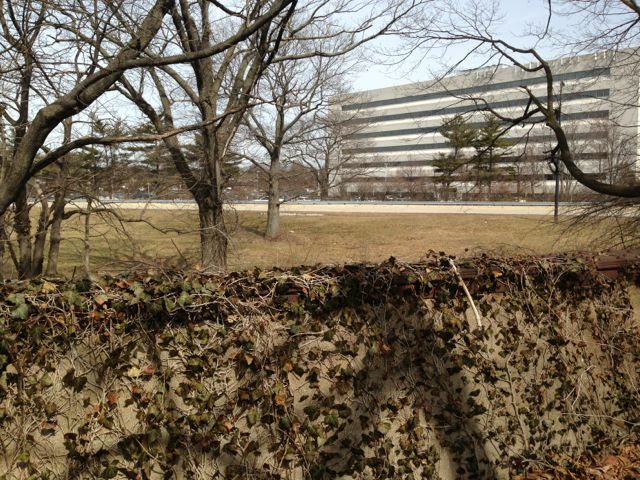 Sunday Hint #1: The plane landed at Roosevelt Field. The view is looking south/east over Westbury and East Meadow. What major buildings and roads are shown? Saturday Hint #1: One of the buildings has already been seen on the website. Saturday Hint #2: A Motor Parkway Bridge (not in the aerial) went over a major road in the Mystery Foto. Merrick Avenue can be seen on the diagonal going from north to south. The Long Island Rail Road Central Extension (formerly the Stewart Line) can be seen on the diagonal going from west to east. Check out Dave Keller's Trainsarefun.com for more information. 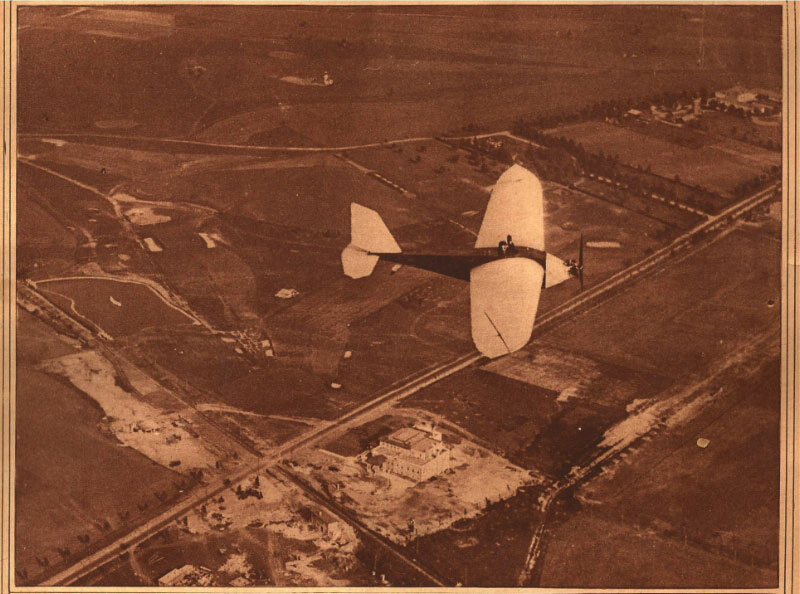 As corrected by Gary Hammond, the clubhouse for the Salisbury Country Club (not the Meadow Brook Club) can be seen below the airplane. The Salisbury Plains Railroad Station was north of the Clubhouse and tracks. 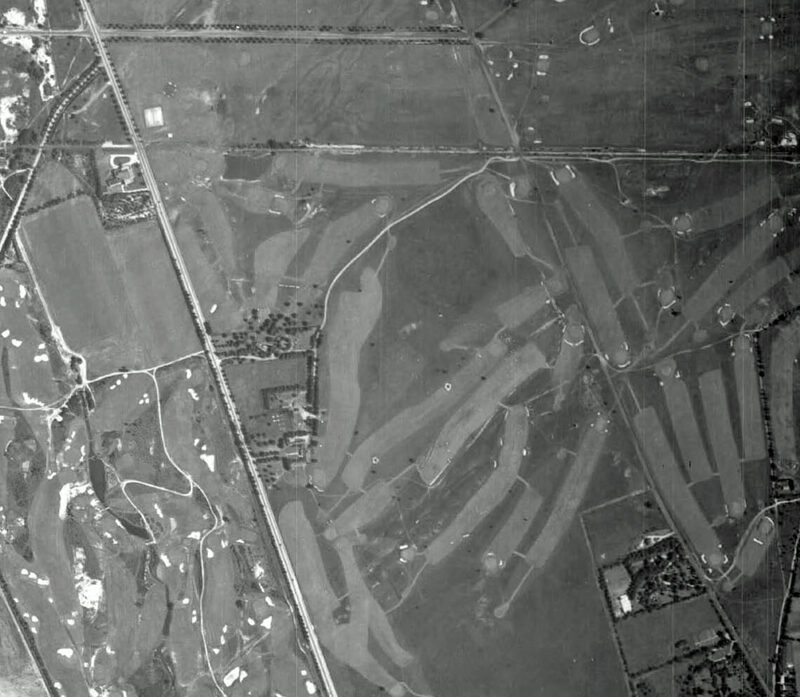 The Salisbury Golf Club in East Meadow was visible to the east. What was the airplane shown and who was the pilot? What was the significance of this plane? What year was the photograph taken? 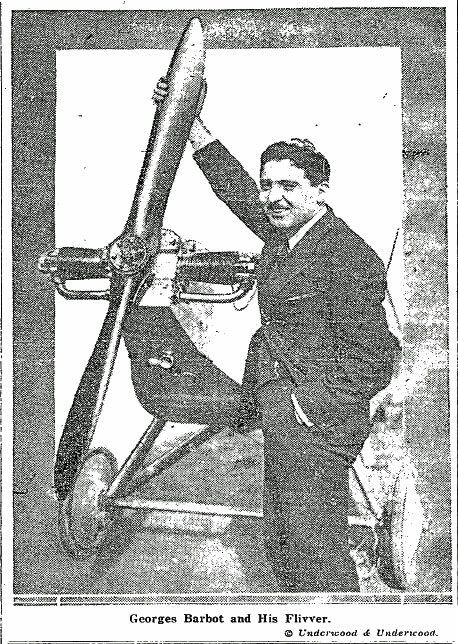 Georges Barbot and the famous "air flivver " in which he won 25,000 francs for crossing the English Channel arrived at Roosevelt Field, L. I., in preparation for a flight to Chicago. The tiny monoplane weighs but 400 pounds without the pilot. Its wing, thick at the body and tapering to knife thickness at the outer edges, its short, slender fuselage, are the last word in lightness and aerodynamic efficiency. The machine has the appearance of a beautiful silver albatross. The two-cylinder engine weighs only 20 pounds and is scarcely bigger than a phonograph motor. It develops 12 horsepower and the plane can fly 60 miles to the gallon. Yet so skilled is the design that Barbot flew to 6,000 feet in 30 minutes, and can attain a speed of 70 miles an hour. Accompanied by the large De Havilland airplanes, the flivver maneuvered beautifully, to the surprised admiration of many experts. 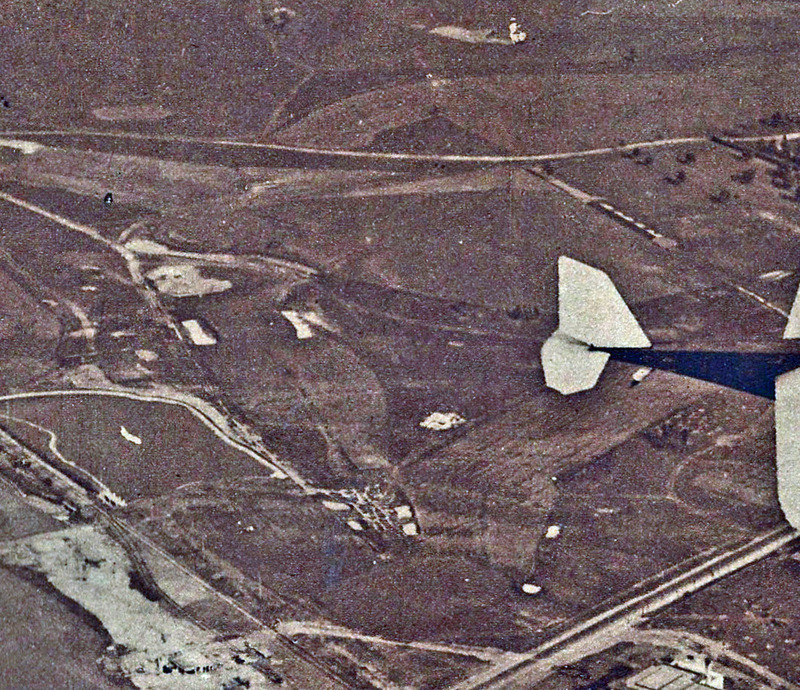 But per-haps the most extraordinary feature of the monoplane is its ability to get away from the ground at not more than 15 miles an hour, and to land in any small field after a very short run of perhaps 50 feet. According to Dewoitine, the designer and builder, who arrived here on the Paris, the machine can be built for $400. Perhaps we have here the safe, easily handled airplane, flown anywhere, which will place aerial joyriding within the reach of every adventurous young man. Can you find a link with this Mystery Foto and the Vanderbilt Cup Races and the Long Island Motor Parkway? 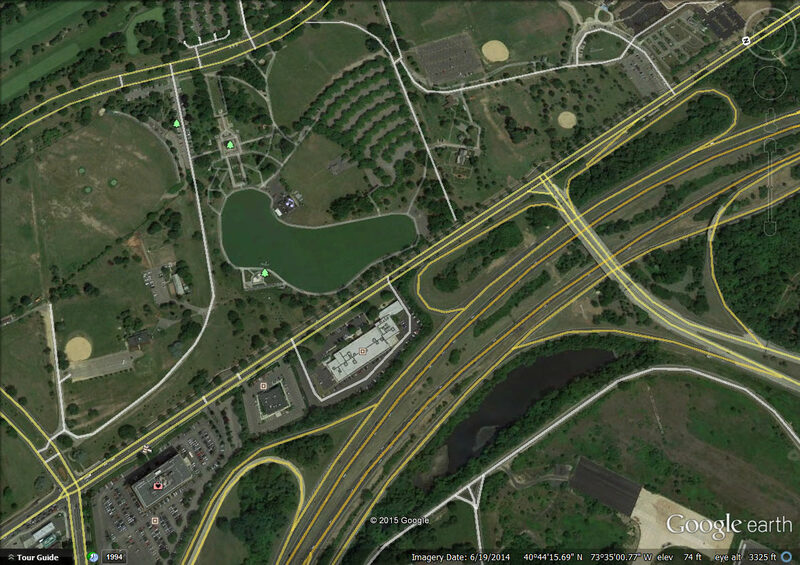 The Long Island Motor Parkway was located just north of the location in this aerial. A Motor Parkway bridge went over Merrick Avenue. The LIRR Central Extension was used to bring spectators to the grandstands of the 1908 to 1910 Vanderbilt Cup Races. Although no one was able to identify the Flivver, congrats to Brian McCarthy, Greg O. and Tim Ivers for correctly identifying the Merrick Avenue location. Excellent Mystery Foto challenge Art! The photo as it appeared in The New York Times. 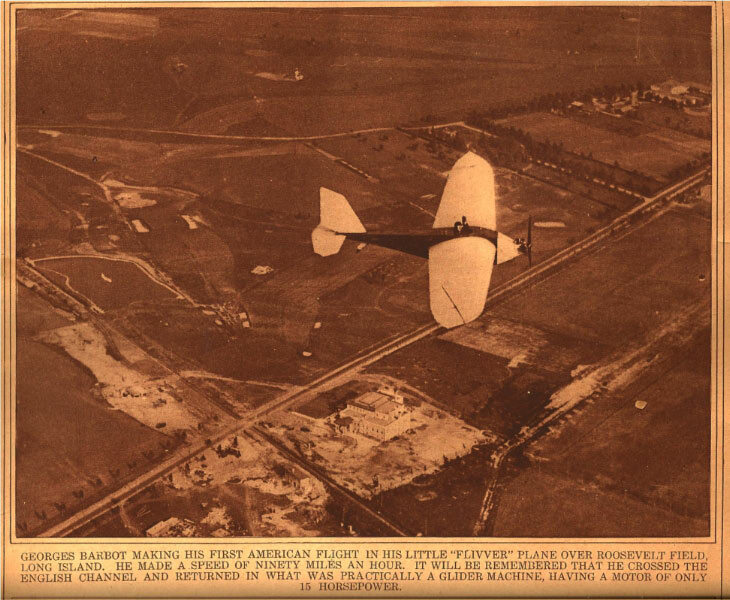 The caption "over Roosevelt Field" was incorrect. 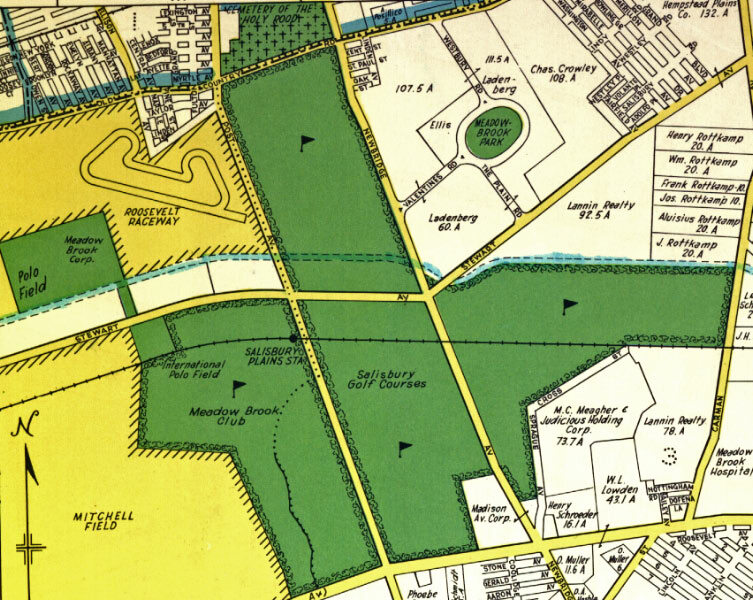 A 1939 map of the aerial's location. 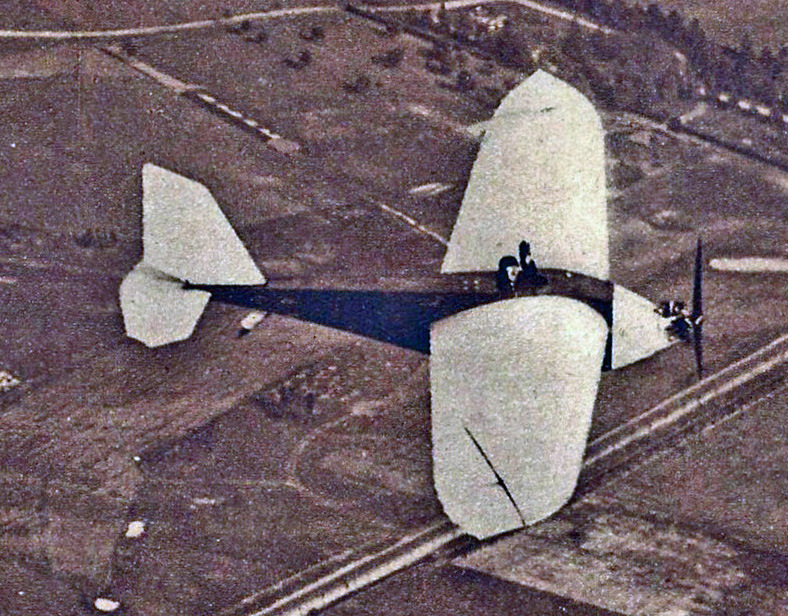 The Flivver flown by Georges Barbot. 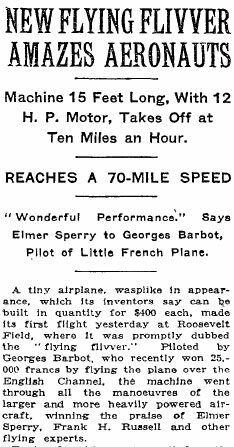 On May 17, 1923, Barbot and the Flivver made headlines when the 15-HP plane crossed the English Channel from St. Inglevert, France to Lympne, England and back winning a prize of 25,000 francs. Intensive study of gliding gives promise of flight on a more economic basis and the possibility of real " air flivvers." Last week another achievement was placed to the credit of the motorized glider. 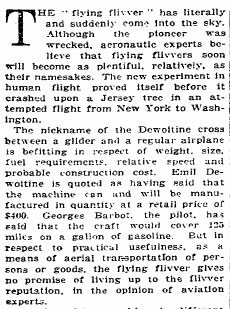 Georges Barbot, French aviator, holder of the world's record for duration of gliding flight, flew across the English channel and back in a tiny monoplane, equipped with only 15 horsepower and carrying but one gallon of gasoline. 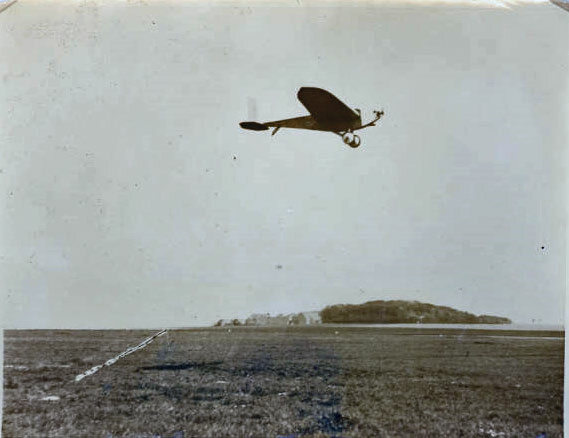 Sixty-one minutes' flight from St. Inglevert, France, to Lympne, England, and forty-four minutes' flight back from England to France, won the aviator a prize of 25,000 francs offered by the Paris Matin. Barbot, expected shortly in America, will visit New York, Chicago, St. Louis, Dayton, returning to France June 15. 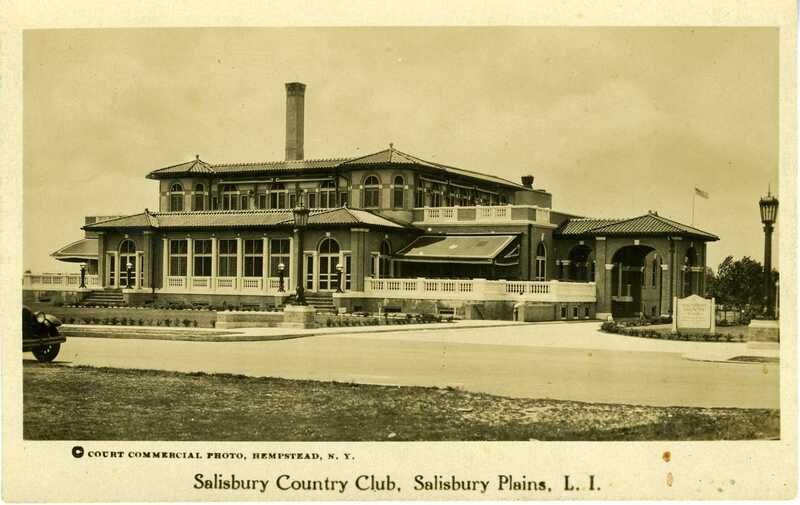 The clubhouse for the Salisbury Country Club was under construction in 1923. The completed clubhouse. Courtesy of Gary Hammond. The remaining section of the clubhouse that was used as research laboratories until the 1980s. 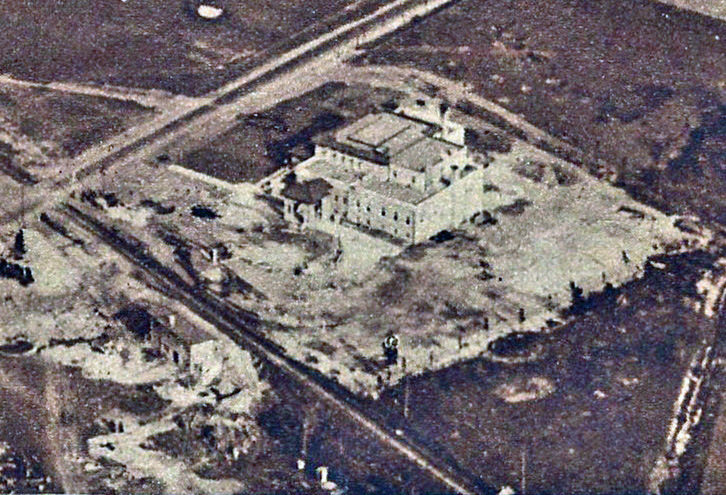 The distinctive Spanish-style brick Salisbury Plains Railroad Station under construction in 1923. Note the chimney. The station after it was abandoned after the track was removed in 1956. I remember exploring the station as a child growing up in East Meadow. It was taken down in the 1980s. 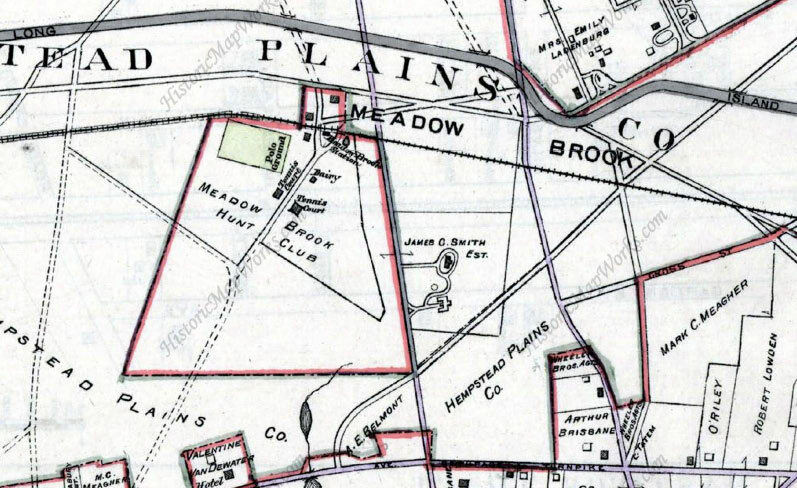 A section of the Meadowbrook State Parkway is located on the former Meadow Brook Golf Course. A train trestle just west of the Mystery Foto location is still there! Location….Overlooking Salisbury and Meadowbrook Golf Links in a southeast direction. Buildings and roads…. 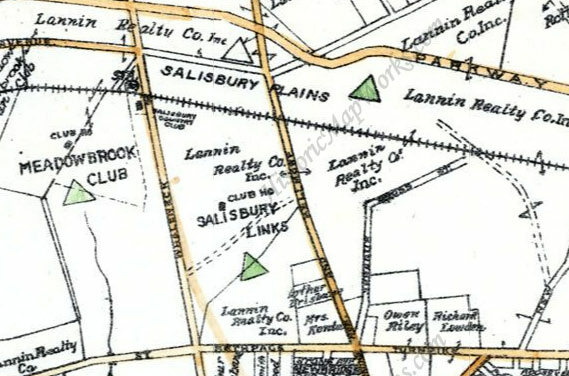 Lannin Hotel and Salisbury RR Station west of Merrick Ave, hotel south of the Central RR row; the station on the north side of the Central RR row. Within the Salisbury Golf links, pretty sure I can see a RR siding spuring on the northside of the Central RR row. I think there’s a culvert or underpass at this point. 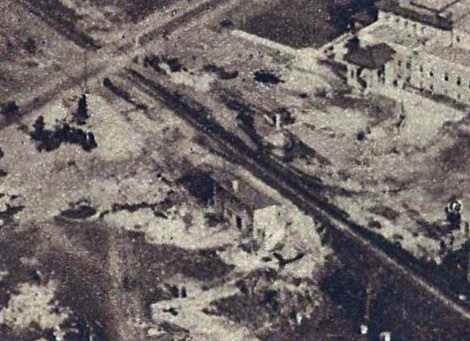 There’s a small building on the southside of this area, associated with the Salisbury links. Airplane/Pilot….It does’nt look likethe Spirit of St Louis. Other than that, I don’t know. Significance of plane….Don’t know. Year….Early 1940’s ?. Link with VCR and LIMP….Don’t know. I do know that the LIMP isn’t seen in this photo. And JJ Lannin was once owner of the Roosevelt Airfield. He set aside a room in his hotel nearby for Mr. Lindbergh, and walked Charles Lindbergh across the tarmac in his airfield to watch his historic takeoff on 5/20/1927. I know there’s a lot of gentlemen here who know the vintage planes like the back of their hand, I just don’t have the knowledge. I’m throwing in the towel on this one after a few days! The only thing I have on this one is the location is looking South West at the where the Central RailRoad and Merrick Ave intersect. I don’t have any info on the plane to answer the rest of the questions, but the building that appears to be under constuction near the intersection would be the clubhouse for the Meadowbrook Club. I’ll guess early/mid-1920’s since I can’t find an exact build date. Stumped, but possibly Herricks/Searingtown, at Searingtown Rd. South/Shelter Rock Rd. and Moore St. tree-lined Herricks High School at bottom left corner, facing SE. towards Roosevelt Field, plane is heading SW to align with runway. LIMP parkway bridge out of view, crossed over Old Searingtown Rd. 1940’s. Looking southeast across Merrick Avenue, East Meadow with the large building resembling the remodeled (1930s) Meadowbrook Golf clubhouse (a large dome was a latter feature behind this building). 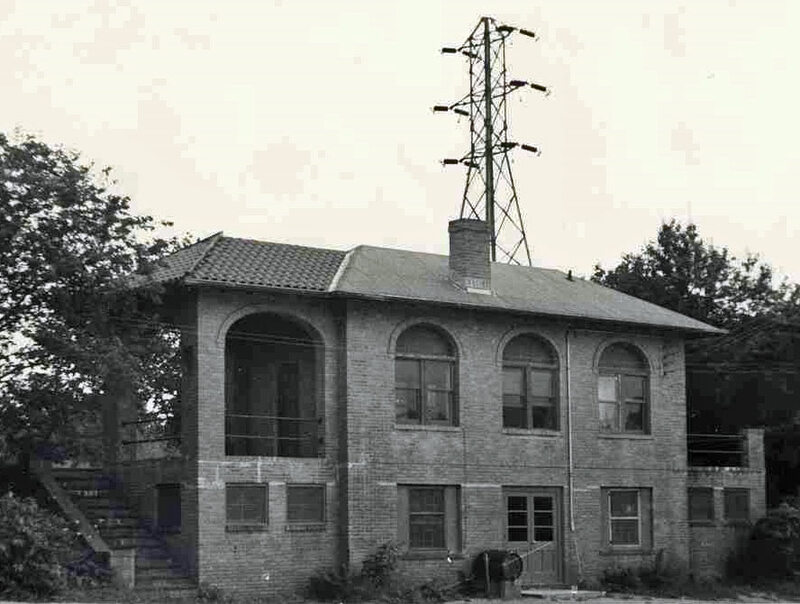 The smaller building looks like the old Salisbury Plains rail station with the rail line running across Merrick Avenue into what is today’s Eisenhower Park. The LIMP crossed Merrick Avenue just a little north (left) in the picture. Just re-read my answer, meant to say looking South East.. This one really had my brain all over the place. Howard or Art…..Why do I have a hard time seeing this aerial as Northeast? From what I’ve read, JJ Lannin did have a hotel in this area. Was it nearby the Meadowbrook Country Club? This aerial is much older than I guessed. The Central RR was in use. Very neat info about this monoplane. Brian, good catch! The view is looking south/east. I believe the clubhouse was built on the hotel’s property. Howard or Art…..I just found a website about “The Lannin Walk”. JJ Lannins hotel was somewhere in Garden City (not the building I originally thought it was, which is The Salisbury Country Club; as you corrected) . Even though he’s not part of this mystery photo, his lifestory is interesting. The 1927 map that Art posted shows “Lannin Realty Co.” all around this area of the solved mystery. I want to thank those people who mentioned my great-grandfather, JJ Lannin, in their comments. 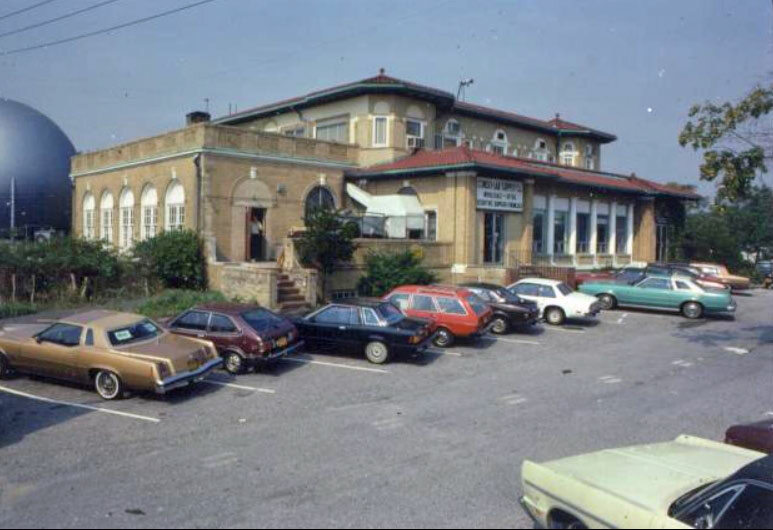 JJ was the proprietor of the Garden City Hotel, Salisbury Links and Clubhouse,he also owned large tracts of land in Long Island, owner of The Granada Hotel in Brooklyn, and he also owner of Roosevelt Field (airport); among many other resorts and properties throughout the NorthEast. JJ was also owner of the Boston Red Sox and he’s credited with signing “the Babe” to play first for his Providence Gray team and then the Red Sox. He also owned the Buffalo Bisons. Please note that my website LanninWalk.com is undergoing a major facelift currently in preparation for The Lannin Walk 2 “Bringing Hannah Home”. So, please follow my adventure on Twitter @LanninWalk and @JJLanninGhost.